Pretty much everything I was hoping for *cough*minusinfect*cough*. Still, UG is full of +1/+1 tokens and manipulators. Evolve would be a fabulous mechanic to run with him. He does die to removal which is a - factor, but for 4 mana in a UG is not bad. I'm sorry but can I just get like a framed picture of this art? 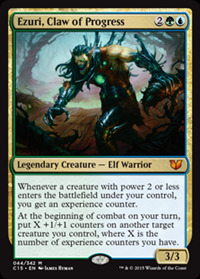 Like I play elves and seeing Ezuri Phyrexian-ized hurts but can we all just take a moment to appreciate how effing awesome he looks?